Download "General Form of Factoring Agreement regarding the Assignment of Accounts Receivable"
2 stationery and postage charged to the account of Client. All invoices are to be clearly marked in a manner specified by Factor, giving full notification to the customer that the account is payable to Factor at its office at the address set forth above. 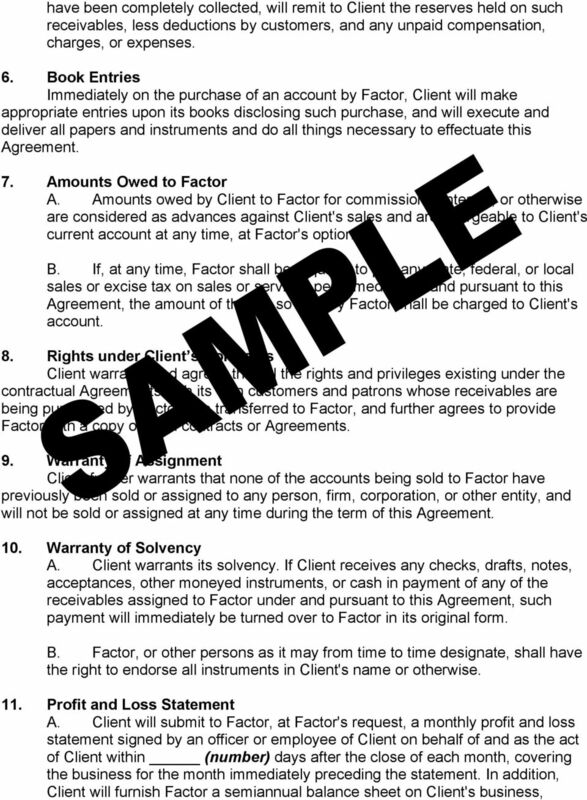 C. Factor has the right to institute and maintain actions in its name or otherwise to collect such accounts. Those actions based upon Client Risk accounts shall be at the cost of Client. Client Risk Account shall mean any account with amounts or invoices which, taken together with those amounts or invoices already existing, exceeds the limit of credit established by Factor with respect to that customer. 3. Credit Approval A. 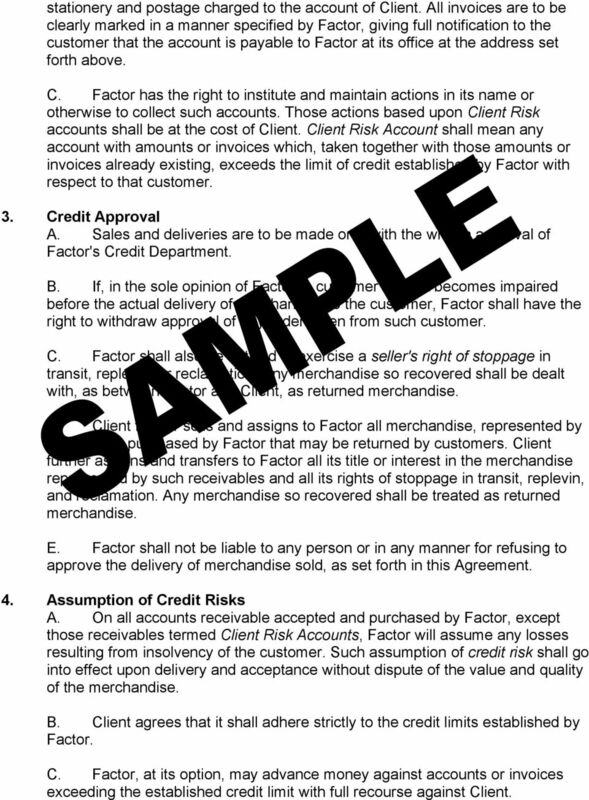 Sales and deliveries are to be made only with the written approval of Factor's Credit Department. B. If, in the sole opinion of Factor, a customer's credit becomes impaired before the actual delivery of merchandise to the customer, Factor shall have the right to withdraw approval of any order taken from such customer. 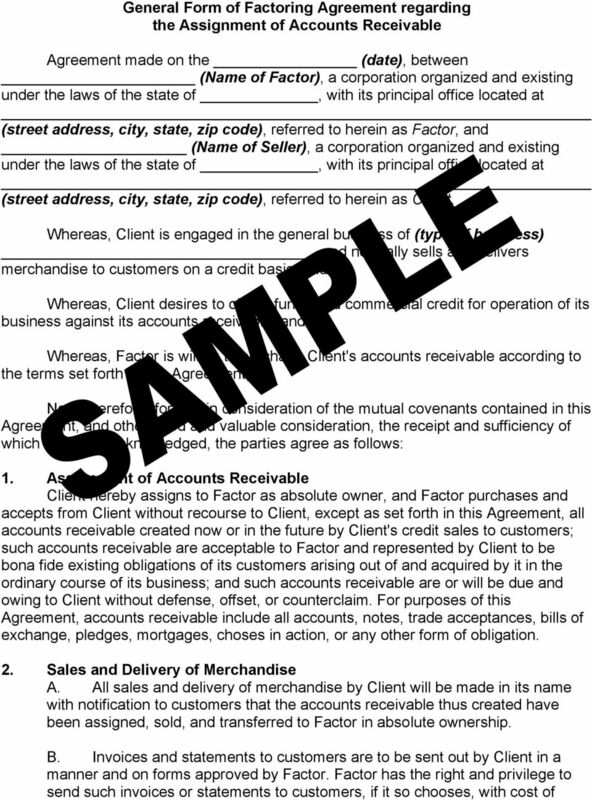 C. Factor shall also be entitled to exercise a seller's right of stoppage in transit, replevin, or reclamation. Any merchandise so recovered shall be dealt with, as between Factor and Client, as returned merchandise. 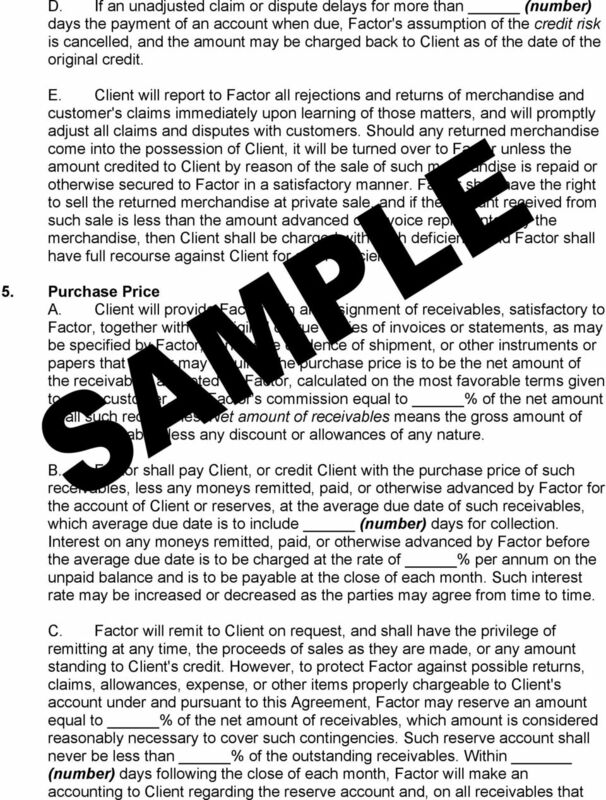 D. Client further sells and assigns to Factor all merchandise, represented by receivables purchased by Factor that may be returned by customers. Client further assigns and transfers to Factor all its title or interest in the merchandise represented by such receivables and all its rights of stoppage in transit, replevin, and reclamation. Any merchandise so recovered shall be treated as returned merchandise. 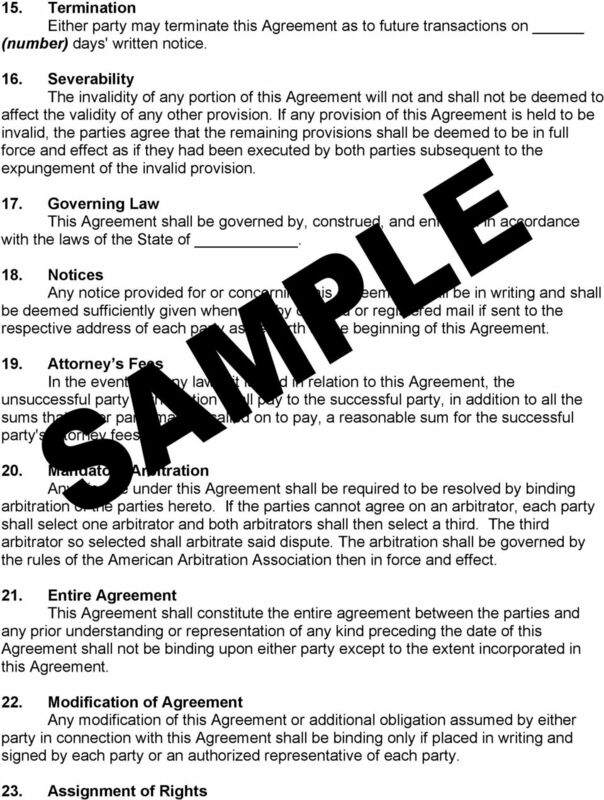 E. Factor shall not be liable to any person or in any manner for refusing to approve the delivery of merchandise sold, as set forth in this Agreement. 4. Assumption of Credit Risks A. On all accounts receivable accepted and purchased by Factor, except those receivables termed Client Risk Accounts, Factor will assume any losses resulting from insolvency of the customer. Such assumption of credit risk shall go into effect upon delivery and acceptance without dispute of the value and quality of the merchandise. B. Client agrees that it shall adhere strictly to the credit limits established by Factor. C. Factor, at its option, may advance money against accounts or invoices exceeding the established credit limit with full recourse against Client. 5 accompanied by a profit and loss statement from the beginning of Client's thencurrent fiscal year. Such semiannual balance sheet and accompanying profit and loss statement shall be prepared by an independent, certified public accountant that has no pecuniary interest in Client's business. B. All the books, records, accounts, corporate records, bank statements, and records of deposit of Client, as well as any other financial records maintained by Client, shall be open to inspection by Factor, and any accountant or auditor designated by Factor, for all purposes and at all times during normal business hours at Client's main place of business. 12. Power of Attorney Client appoints (Name of Representative of Factor), or any other person whom Factor may designate, as Client's attorney-in-fact with power to receive, open, and dispose of all mail addressed to Client; to notify postal authorities to change the address for delivery of mail addressed to Client to an address that Factor may designate; to endorse in Client's name any notes, acceptances, checks, drafts, money orders, and other evidences of payment or collateral that may come into Factor's possession, to sign Client's name on any invoice or bill of lading relating to any account, on drafts against debtors, assignments and verifications of accounts, and notice to debtors; to send verifications of accounts to any debtor; and to do all other acts and things necessary to carry out this Agreement. All acts of such attorney or designee are ratified and approved, and such attorney or designee shall not be liable for any acts of commission or omission, nor for any error of judgment or mistake of law or fact. This power, being coupled with an interest, is irrevocable while any purchased account shall remain unpaid. 13. Breach of Warranty If any warranty or covenant in this Agreement, express or implied, shall be broken or violated, whether caused by the act or the fault of Client, a debtor, or others, Factor shall be entitled to recover from Client or Client's guarantors the damages consequently sustained, including, but not limited to, all attorney's fees, court costs, collection charges, and all other expenses that may be incurred by Factor to enforce payment of any account, either as against the debtor, Client, or its guarantors, or in the prosecution or defense of any action or proceeding related to the subject matter of this Agreement. 14. Waiver A. 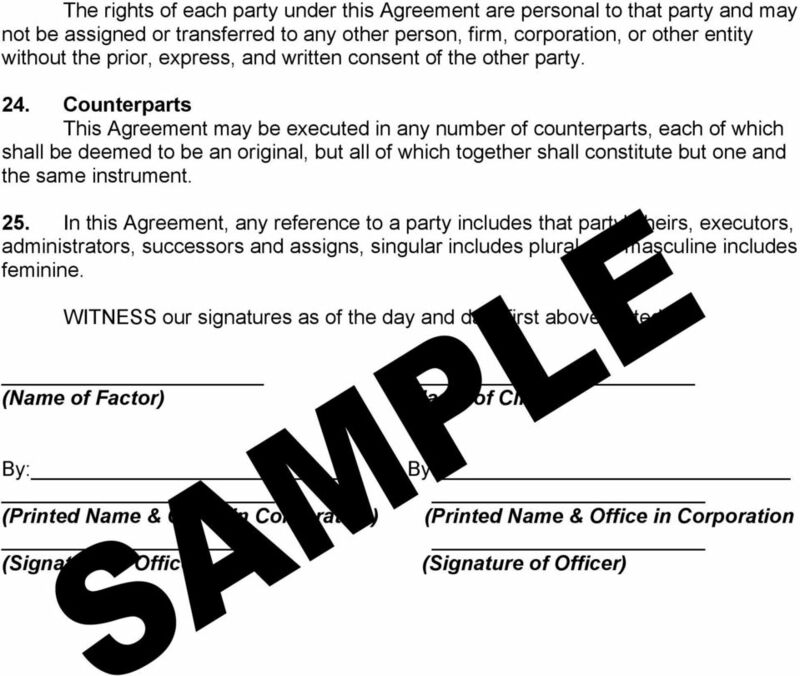 Factor's waiver of a particular breach by Client of any covenant or warranty contained in this Agreement shall not be deemed to constitute a waiver of any subsequent breach. B. Factor's failure at any particular time to exercise a right or privilege granted to it in this Agreement shall not be deemed to constitute a waiver of that or any other right or privilege.